Harold Stubbs and Alan Burleigh with their champion bull Derrycallaghan Fireworks. The luck of the Irish prevailed in the show ring at Stirling on Sunday with both the supreme champion and reserve supreme champion rosettes awarded to breeders from Northern Ireland. 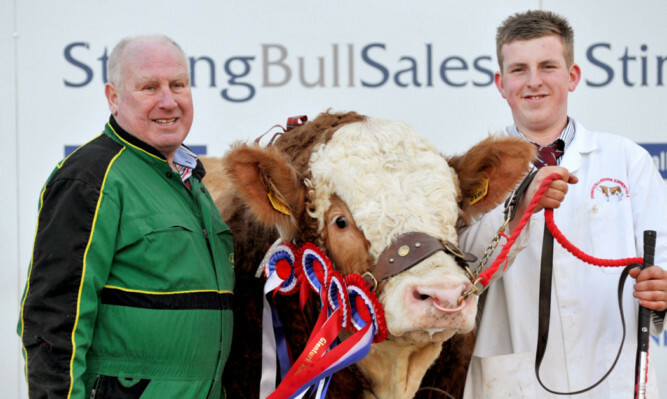 Leading the charge on the opening day of the second week of the spring Stirling Bull Sales was Derrycallaghan Fireworks, from grandfather and grandson duo Harold Stubbs and Alan Burleigh of Crummy, Ballindarragh. The duo, who took the same title at last year’s fixture, lifted this year’s rosettes with a February 2014-born AI son of Slimero Victory, out of Derrycallaghan Winner. Judge Gary Christie, of Midtown of Glass, Huntly, said the champion was a “well-fleshed young bull” with a “good bit of character about it”. Taking the reserve overall and intermediate champion rosettes was July 2014-born Kilbridge Farm Foreman from Billy, Michael and Matthew Robson, Doagh, Ballyclare. Foreman is a home-bred son of Crugmelyn Brenin out of Kilbride Farm Jolly 7T. The Robsons also took the reserve intermediate champion rosettes with August 2014-born Kilbride Farm Fearless, which is by Crugmelyn Brenin and out of Kilbride Farm Eunice 105B. Meanwhile, the senior champion title was awarded to Stewart Stronach, Berryleys Farm, Grange, Keith. Islavale Ferrari is a home-bred April 2014-born son of Curaheen Bandit, out of Islavale Victoria. The reserve senior champion title went to father and son duo Val and Conrad Fegan of Rostrevor, Newry, Northern Ireland. Knockreagh Feggy is an AI son of Kilbride Farm Bantry out of Knockreagh Annabelle. Meanwhile, the reserve junior champion rosettes were awarded to Michael Barlow, Foar Oaks, Ulnes Walton Lane, Leyland. Denizes Fantastic is a November 2014 AI son of Whitemire King Kong out of Denizes Tonia 4th. In the female section, the champion title went to Northern Irish breeder Robin Boyd, Slievenagh Farm, Portglenone. Sterling Myra’s Erin is an October 2013-born daughter of Sterling Cotswold 11, out of Thursford Myra 21st. Lastly, the reserve female champion title was awarded to Gerald and Morag Smith’s Drumsleed herd at Fordoun, Laurencekirk. Drumsleed Flick is a March 2014-born daughter of Grangewood William, by Popes Laird, out of Drumsleed Patti.